SCOTTSDALE, Ariz., September 13, 2018 – cStor, a leading provider of data center, digital transformation and cybersecurity solutions, announced today that Hewlett-Packard Enterprise (HPE) has authorized cStor to participate in their National Association of State Procurement Officials (NASPO) ValuePoint Indirect Fulfillment Program. 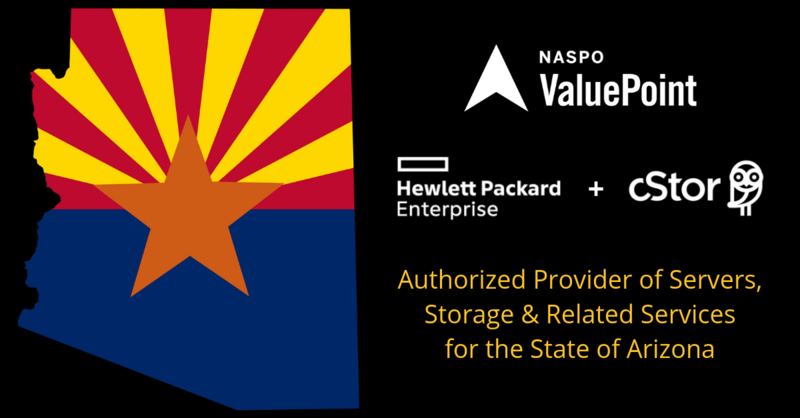 Through the HPE NASPO ValuePoint State of Arizona contract number ADSP016-112918, cStor is now authorized to sell servers, storage and related peripherals and services to qualified state, local and education organizations. The HPE NASPO ValuePoint program provides buyers an opportunity to buy from established leaders like cStor who provide expertise and experience specific to the client’s needs while leveraging public cooperative pricing. cStor brings more than 16 years of experience serving State of Arizona clients. Our expertise in offering the optimal data center solutions and consulting services, along with HPE's wide selection of products, will help our teams design solutions to fit each public sector entity's needs and budget. For more information or to purchase products through the HPE NASPO ValuePoint program, visit http://gov.cstor.com/arizona/. cStor helps companies strategize, create and implement data center, cloud and cybersecurity solutions that help clients use IT to enable business transformation, reduce costs and gain competitive advantage. cStor’s proven capabilities with key data center and cloud technologies give clients the ability to collaborate with certified experts and the confidence to move business forward faster and more efficiently than ever before. cStor serves clients across the southwest region with a focused, collaborative approach and superior results. For more information, visit www.cstor.com.